Hi, HoC icon was missing. Its back now, but all flashy cards are missing. I have SS, but cannot upload SS as it appears forum support upload feature is broken as well. OK, Thanks. 6 SS upload in this reply. As far as I can remember, I had at least 6x Flashy 7 of Spades and 8x Flashy 7 of Hearts, maybe more. 2. did you had those flash cards in the last HOC? Are you a moderator? Look something happened in HOC and we need a mod to look into it. Not players like ye who r not aware of actual situation. 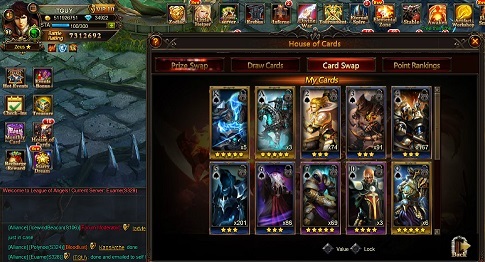 Since HoC is over after today and my flashy cards from day 1 of HoC are still missing, please request that I get the equivalent in exchange as in hot event for flashy card exchange. Therefore, ;for each missing flashy card, i would expect to receive a lvl 7 superior/common gem chest and 2000 vouchers. Note, that I got more flashy cards on subsequent days of HoC, but these are not to be confused with the ones from day 1 that went missing. Those were never returned or replaced. No update yet from rabbitfins. I guess FM and LOA are ignoring me. 2019-4-22 10:47 GMT+8 , Processed in 0.076272 second(s), 52 queries .